What are your thoughts on fleet vehicle tracking? You might get different responses when talking to different people. For instance, some businesses will tell you that fleet vehicle tracking is a necessary tool. Fleet managers are able to plan their work, measure assets, manage drivers, and reduce downtime. However, some drivers will strongly disagree. For them, fleet vehicle tracking is a spying tool. Some drivers might nicely say that “it invades my privacy” while others bluntly call it “a piece of #@#@”. Some fleet vehicle tracking systems like Geotab have a Privacy Mode. Privacy Mode is a tool that disables vehicle tracking functions such as live map monitoring, trip history reports, and driving habit reports during “exception periods”. And what are exceptions? Exception periods are any defined time periods. For example, a business may label anytime between 5pm and 8am as an exception period. How do I use Privacy Mode on Geotab? A great resource is Geotab’s User Guide. 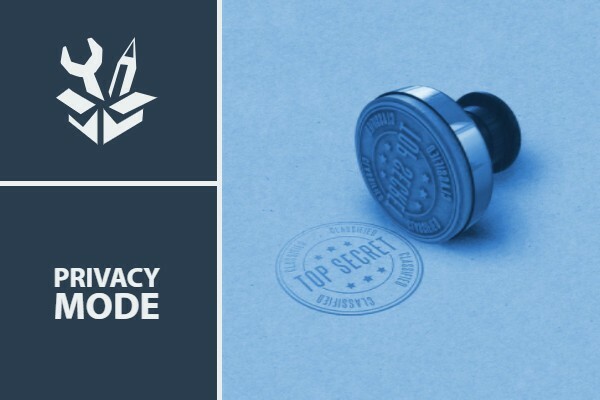 The guide outlines how to enable Privacy Mode, disable Privacy Mode, edit Privacy Mode and set up exemptions. 1) Firstly, from your main menu, go under Rules & Groups and select Rules. 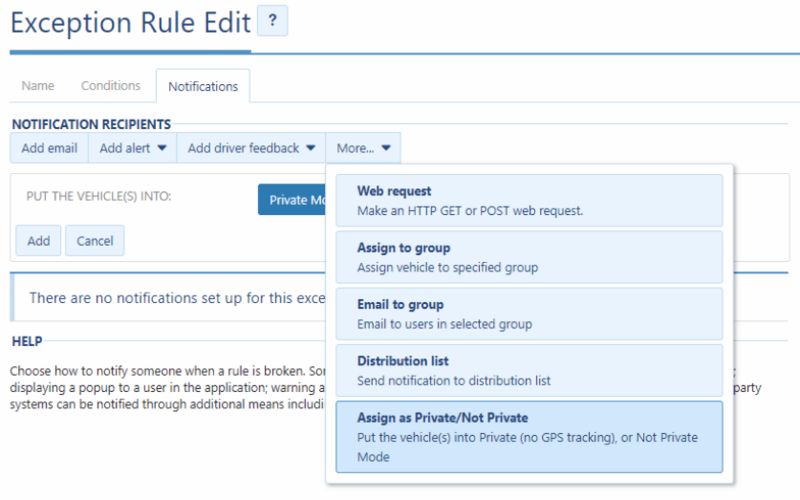 2) Once you are on the Rules page, go to Exception Rules and press Add. 3) Then, set your exception conditions by pressing Conditions. 4) Go to the Notification tab, select More, and then click Assign as Private/Not Private. 5) Finally, save your new rule by pressing Add and then selecting Save. What does Privacy Mode Look Like? When vehicles are on Privacy Mode, the Geotab unit will not record any GPS related events. In trip history or driving behavior reports, any trips under Privacy Mode will be marked as “Private Trip”. Who Should Use Privacy Mode? Privacy Mode would make sense in a few situations. Here are two examples. Some fleets are restricted by unions. For example, the Massachusetts State Police union recently objected against the department’s fleet vehicle tracking project. According to the union, the police department acted in bad faith because they never gave the union a chance to negotiate a GPS tracking policy. In some fleets, the union ends up winning. However, because of Privacy Mode, fleets were able to keep vehicle trackers in their vehicles. As a result, even though fleets couldn’t measure driving productivity or safety, fleets can still monitor things like preventative maintenance. Another good example include employees that use personal vehicles. In some companies, businesses will ask employees to use their own vehicle for business. However, the company will reimburse drivers for fuel. The next question, then, is how can companies measure fuel reimbursement and compensation? After all, since employees are using their personal vehicles, it would be unreasonable to track employees on their personal hours. Privacy Mode allows businesses to make that compromise. Employees can turn off tracking during their personal hours while businesses can still track work hours.